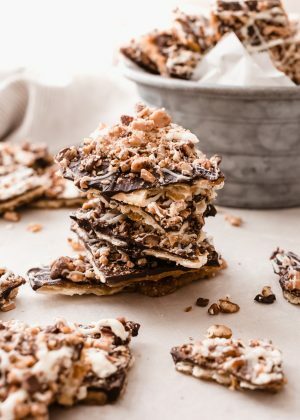 Whether you call it a saltine toffee bark or Christmas crack, all I know is this is super addicting! Christmas crack is super easy to make and requires seven simple ingredients! Okay, so right about now you’re probably wondering, what the heck is Christmas crack? If you’ve never heard of it before, let me explain. 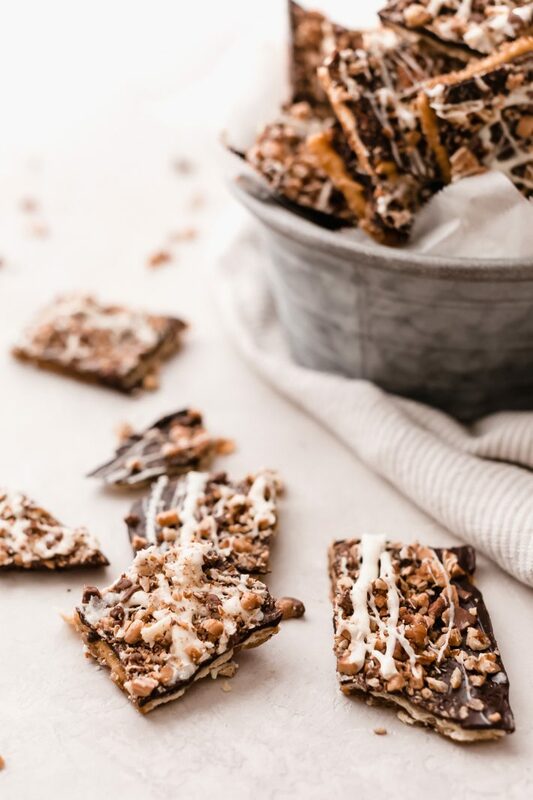 It’s salty crackers topped with easy homemade two-ingredient caramel that’s baked into the crackers. Then slathered with melted chocolate and topped with all sorts of crunchy things! 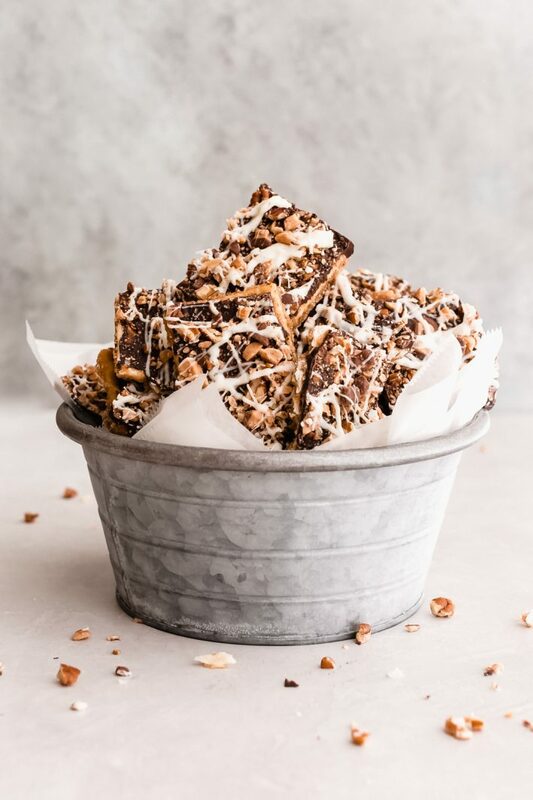 It’s sweet and salty at the same time and if you think you don’t like salty and sweet together, wait until you try my homemade Christmas crack. Today’s recipe is really basic, all you really need are seven simple ingredients, and there are tons of variations that I’ve shared so you can make these again and again well into the new year. I happened to make a batch of Christmas crack right before Thanksgiving, so I took them along for the feast, and I have to say, I didn’t think anything could outshine my pumpkin pie but boy, did I hear rave reviews about the Christmas crack! 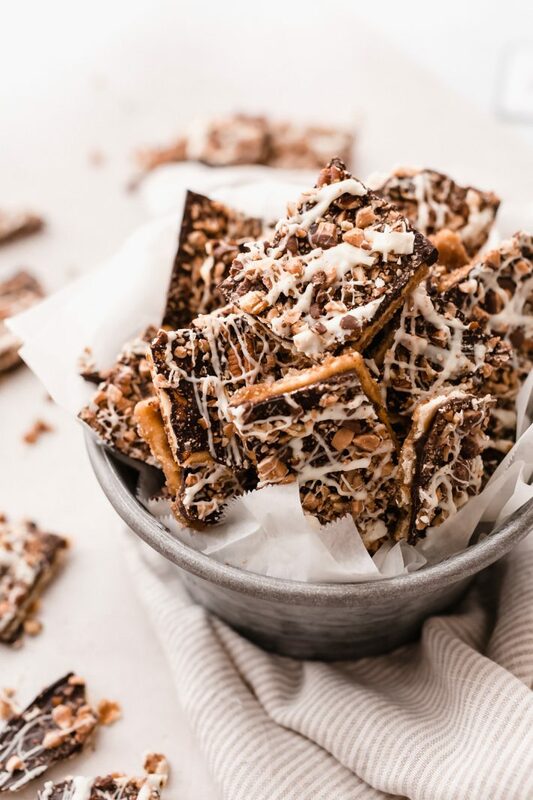 Christmas crack or saltine toffee is quite possibly the simplest thing you can make if you aren’t the biggest fan of baking but still want something homemade around for the holidays. It makes for a great gift for neighbors, coworkers, friends, and family. All you really need is pretty tins or boxes  (affiliate link) to pop them in. If you’re looking for other festive treats to make for gifts, I suggest trying my spiced chai pumpkin muffins , homemade Nutella , apple crumble bars , brown butter maple pecan banana brea d, or gingerbread muffins . WHAT DO YOU NEED TO MAKE CHRISTMAS CRACK? A note on the saucepan. When making caramel, I find it works best to use a pot that doesn’t have a dark colored interior. I use a stainless steel saucepan (similar linked.) That way, you can monitor the color of your caramel easily! Darker interior saucepans make this super tricky. Don’t worry if you’ve never made caramel at home before; I’m going to walk you through this, it’s not hard! First, you want to gather all your ingredients. It’s just two things: butter and brown sugar. Then, we’ll melt the butter and brown sugar together in our saucepan until the sugar dissolves. Once the sugar dissolves and the caramel comes to a boil, set a timer for 3 minutes on your phone. Let it bubble and deepen in color, and you may be tempted to stir, but don’t! As soon as that timer goes off, remove it from the stove and pour the caramel directly onto the crackers. Spread the caramel using an offset spatula to make sure all the crackers are evenly covered. Pop this into the oven and let it bake. HOW DO WE GET THE CHOCOLATE TO MELT FOR CHRISTMAS CRACK? When your caramel and crack base has baked, immediately remove it from the oven and sprinkle on your chocolate chips. Let the chocolate hang out for a minute, the heat from the caramel will warm it and make it easier to spread. Then spread the chocolate using an offset spatula. If it doesn’t melt, don’t worry, just pop the baking sheet back in the oven for roughly a minute or so then attempt the spread again! Then all that’s left to do is sprinkle on your toppings! DO YOU HAVE TO USE SALTINE CRACKERS FOR CHRISTMAS CRACK? CAN I USE ANYTHING ELSE? If you aren’t a fan of saltine crackers, Ritz crackers will work equally well here. Can I also just say that they might be extra delicious because of all of that yummy buttery flavor! WHAT IF I HAVE A TREE NUT ALLERGY, CAN I STILL MAKE CHRISTMAS CRACK? If you have a tree nut allergy, feel free to leave out the pecans and use something else in its place! You can use the toppings listed below exclusively or swap the pecans for roasted pumpkin seeds. The salty kind is the way I’d go! WHAT ELSE CAN I SWAP FOR THE TOPPING ON MY CHRISTMAS CRACK? If you’re not a big fan of heath toffee bits, you can swap them out for mini m&ms or Reese’s pieces. Crushed up candy canes or even holiday colored sprinkles would make this yummy! 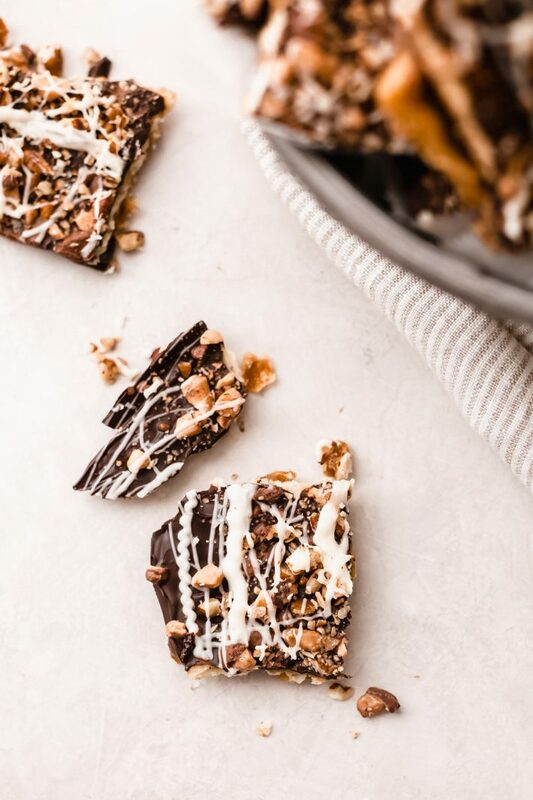 To make this more of a grown-up saltine toffee, I like to finish mine with a pinch of Maldon sea salt to cut through some of that sweetness. However, that is purely optional! Use a baking sheet that has a rim. A rimmed baking sheet is important so that the caramel doesn’t run off the sides. Trust me; you don’t want to have to clean burnt toffee in your oven, no bueno! Use good quality chocolate; it makes all the difference! I can’t stress this enough. Here’s  (affiliate link) the chocolate I prefer to use when I make Christmas crack. Swap out the dark chocolate for what you like! If you’re someone that prefers your desserts on the way sweeter side make this with semi-sweet chocolate chips. Me? I stick to the dark chocolate because the caramel makes this plenty sweet for me! To cool and consume this faster, you can pop the prepared Christmas crack into your freezer for roughly 30 minutes. Then, just break into pieces and enjoy! Christmas crack lasts for a while in the fridge! I made it a week ago, and we’ve still got some left. Just break it up into smaller portions and pop it into an airtight container. 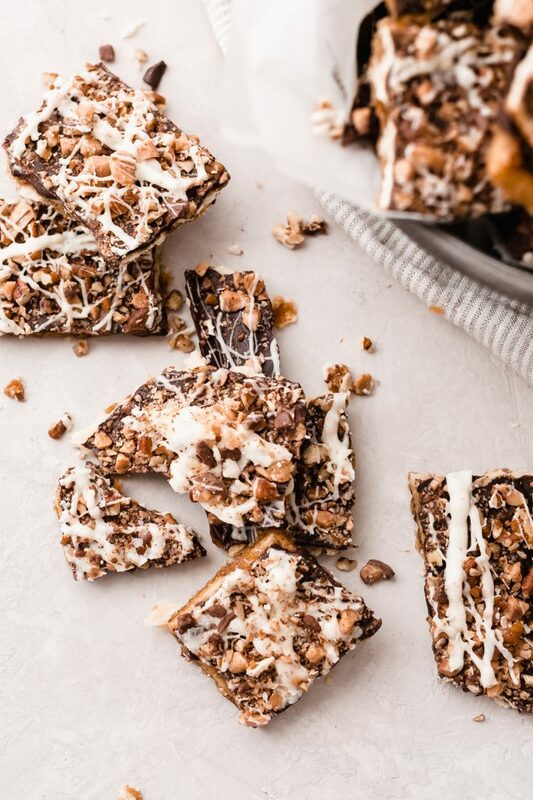 Christmas crack is easy breezy so make some this weekend and watch how quickly this stuff disappears! P.S. Check below the recipe if you’d like to enter the Little Spice jar $500 Giveaway! 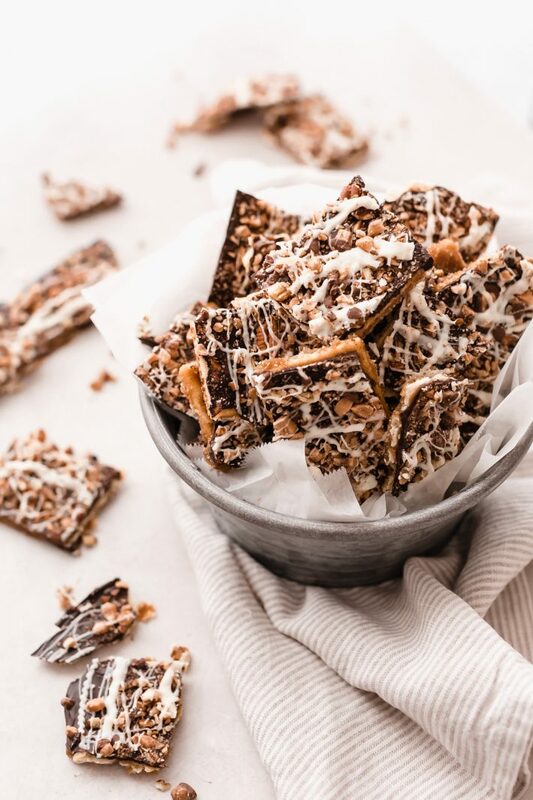 Whether you call it a saltine toffee bark or Christmas crack, all I know is this is super addicting! Christmas crack is super easy to make and requires 7 simple ingredients! CARAMEL: Position a rack in the center of the oven and preheat the oven to 350ºF. Line a baking sheet with a silicone mat or parchment paper, trust me, you don’t want to skip this! Place the saltine cracker side by side, in a single layer on the baking sheet; set aside. Melt the butter and brown sugar together in a saucepan until the sugar dissolves, stirring as required until the caramel comes to a boil. Once it boils, don’t stir it, just let it cook for 3 minutes. Carefully pour the caramel over the saltines and make sure all the crackers are covered in the caramel, using an offset spatula. Bake for 8 minutes. CHOCOLATE: Pull the baking sheet out of the oven and immediately top with the chocolate chips. Let the chocolate sit for a minute and heat through, then spread using an offset spatula. If all of the chocolate doesn’t melt right away, pop the baking sheet back in the oven for roughly 1 minute or until the chocolate spreads easily. DECORATE: Top with chopped nuts and heath toffee bits. Melt the white chocolate in the microwave (see notes) and drizzle on top; sprinkle with Maldon sea salt if desired. Let cool for several minutes before placing it in the refrigerator to cool for at least 2 hours or pop it into the freezer for roughly 30 minutes if you want to have them ready to eat quicker! if you don’t have salted butter, just spread the caramel on the saltines and sprinkle on a big pinch of flaked sea salt before topping with the chocolate. leftover saltine toffee can be stored in the refrigerator in an airtight container for up to 3 weeks. Leftovers can also be frozen for a couple of months! to melt the white chocolate, pop it into a micowave-safe bowl and zap for 20 seconds. Remove and stir, if most of the chocolate chips are melted by this point, try stirring, if the chocolate is still solid, microwave for 10 seconds, stir, and see if that does the trick. White chocolate will seize up if it’s zapped to long so it’s better to do it in smaller increments if you’ve got a super powerful microwave! ENTER IN THE LITTLE SPICE JAR TURNS 5 $500 GIVEAWAY!